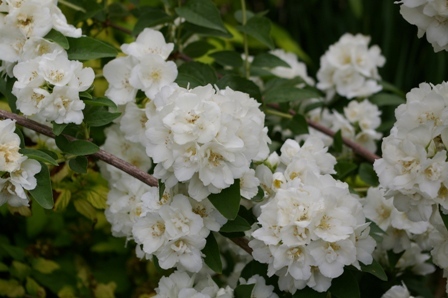 Joy Creek Photo Archive (c) all rights reserved In an enclosed area, the intense fragrance of Philadelphus x lemoinei 'Manteau de Hermine' perfumes the entire space. Breath-taking racemes of double flowers. Late spring to early summer. 3 ft. x 5 ft.